TOKYO, JAPAN, November 29, 2018 --- NTT DOCOMO, INC. (DOCOMO) and Toyota Motor Corporation (Toyota) today announced that they have successfully controlled the Toyota-developed T-HR31 humanoid robot in trials using fifth-generation mobile communications2 (5G) under a test environment with control from a remote location (a distance of approximately 10 kilometers) using 5G in an area between two points. Toyota developed the T-HR3 with the aim of creating a partner robot that can safely support human activities in a variety of circumstances, such as homes and healthcare institutions. By employing Torque Servo Modules that control torque (power) and a Master Maneuvering System that allows the robot's entire body to be operated at will, the operator can feel external forces exerted on the T-HR3 and prompt it to move in the same manner as them. To ensure it achieves gentle, smooth movement, minimizing communication delays during control signal exchange between the T-HR3 and the Master Maneuvering System is essential. Until now, T-HR3 experiments have been conducted on a wired connection, with relatively few communication delays. This time, with an eye toward improved use in practical environments, the T-HR3 was successfully controlled wirelessly, using low-latency 5G communication technology developed by DOCOMO. DOCOMO and Toyota plan to demonstrate the technology between Tokyo Big Sight and Tokyo Skytree as part of the DOCOMO Open House 20183 , which will be held at Tokyo Big Sight over two days starting on December 6, 2018. 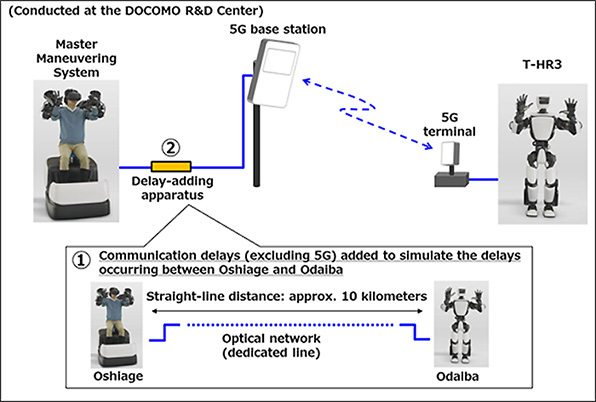 DOCOMO and Toyota aim to continue conducting trials based on diverse scenarios of robot use, and intend to research and develop technologies and services with the aim of realizing 5G services in 2020 and, subsequently, a prosperous society of mobility. 2. NTT DOCOMO is aiming to offer 5G pre-services in September 2019, with plans to roll out full-scale commercialized 5G services in spring 2020. Toyota Motor Corporation (TMC) is the global mobility company that introduced the Prius hybrid-electric car in 1997 and the first mass-produced fuel cell sedan, Mirai, in 2014. Headquartered in Toyota City, Japan, Toyota has been making cars since 1937. Today, Toyota proudly employs 370,000 employees in communities around the world. Together, they build around 10 million vehicles per year in 27 countries and regions, from mainstream cars and premium vehicles to mini-vehicles and commercial trucks, and sell them in more than 170 countries and regions under the brands Toyota, Lexus, Daihatsu and Hino. Trials were conducted at the DOCOMO R&D Center in Yokosuka City, Kanagawa Prefecture, using the 28 GHz band as the 5G frequency band. To simulate communication lags except for the 5G zone (for a straight-line distance of approximately 10 kilometers), delay times between Odaiba area and Tokyo Skytree (in Oshiage) were measured in advance (see ① in below image). The communication delay times were then added to the delay-adding apparatus (see ② in below image). By employing a 5G base station and 5G terminal along the separation distance, the trials verified that control of the T-HR3 is possible using wireless communications. More specifically, the trials confirmed that the T-HR3 is capable of performing tasks that require the transmission of force, such as holding a ball with both hands, grasping blocks and stacking them up into a pile, and shaking hands with a human, at levels comparable to those of a wired connection.